It’s about time the Firefly geeks take center stage. 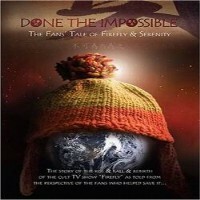 Done the Impossible chronicles the birth of the cult TV show Firefly. The only difference is that its told through the eyes of the fanboys and girls who made the show a hit. Moreover, it relates of how they came to be a key in helping to create it counterpart movie, Serenity. Done the Impossible compiles interviews of cast, crew and fans of the show. It showcases their passion for Firefly and their struggles in keeping the show afloat. The cast and crew also join in on the action and share funny and insightful experiences they had in the show. So if you are a big Firefly geek, then you’ve hit the jackpot on this one. For ordinary folks who never got a chance to get acquainted with Firefly, this was an American TV show that combined outer space with Western motifs. It was created and produced by Josh Whedon. The same guy that brought us two popular TV shows that you might be more familiar with, namely Buffy the Vampire Slayer and its spin off Angel. Although the show debuted on Fox and was made available in both the US and Canada, its life span was cut short. After only eleven episodes that went on air, the show was canceled because of low viewer ratings. There was much hype about this Josh Whedon project initially, but it had to be pulled out of the air when it averaged only 4.7 million viewers and it received a low feedback from Nielsen Ratings. However, despite its short existence, the show went on to garner a massive cult following. It also became more successful when it was released in DVD. Hence, it wasn’t long before production of the movie, Serenity, came into fruition. As a way to capture this whole transition and legacy of Firefly as well as the fans struggles to uphold their love for the show, Done the Impossible was produced and created. This documentary had everything to do with the fans, in fact, they pretty much did everything. What’s great about this documentary is not just the information you get on Firefly but it shows how fans can dictate and even influence the outcome of their favorite shows even if they have received the cut. Think fanatical Roswell fans, only take it a step further and you have Firefly fans that were capable of encouraging the big ups to create a movie based on a cancelled show. For fans of the show, there are over 6 hours worth of material included in the DVD. Music videos, interviews and fan stories are incorporated in this lighthearted documentary. This might not be the perfect documentary to watch if you are absolutely clueless of the show. Essentially, this documentary is ideal for someone who is obsessed or at least has seen Firefly several times. However, if you are feeling a bit curious, then maybe it could open you up into the world of Malcolm Reynolds and the rest of the Serenity crew.